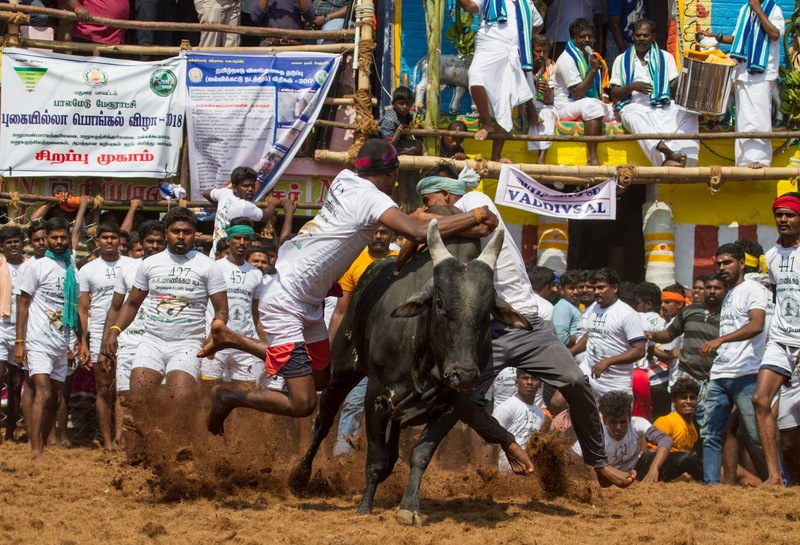 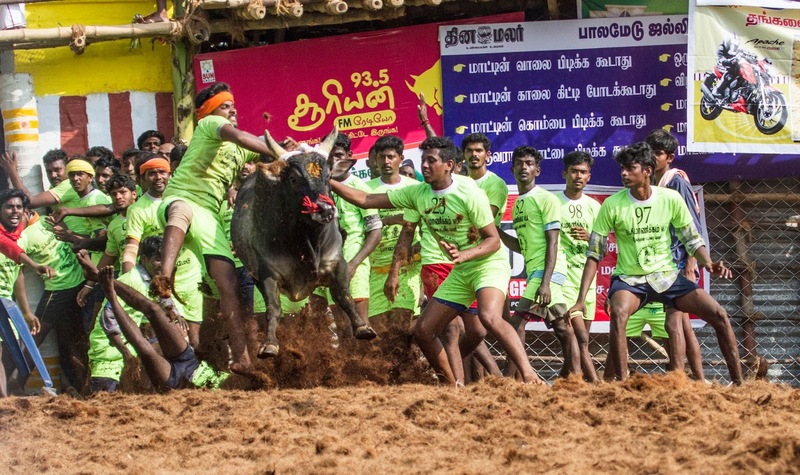 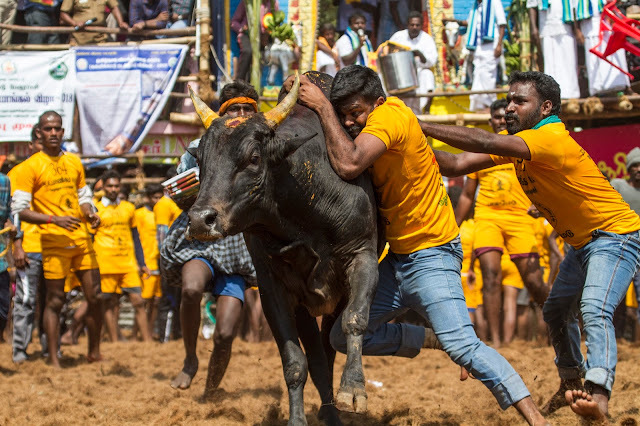 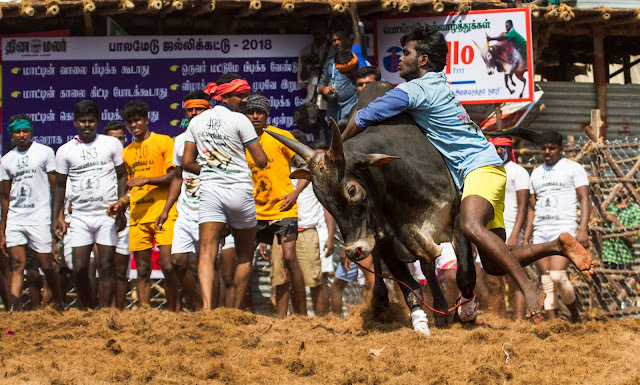 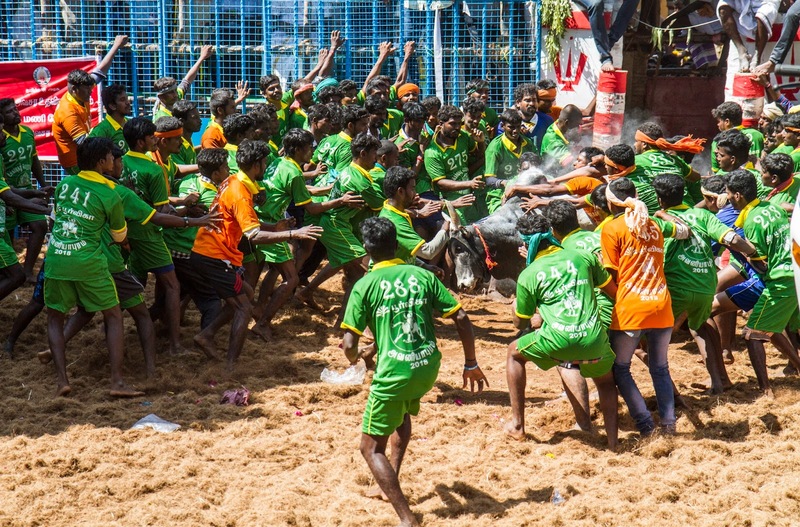 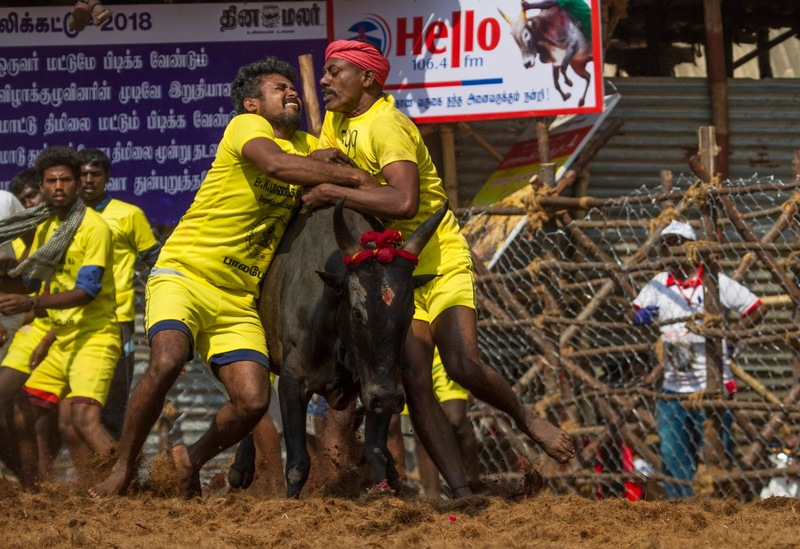 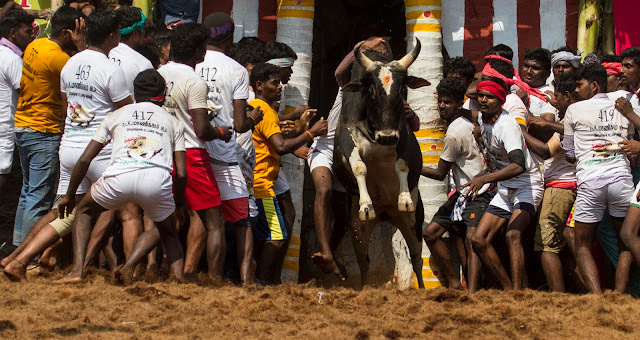 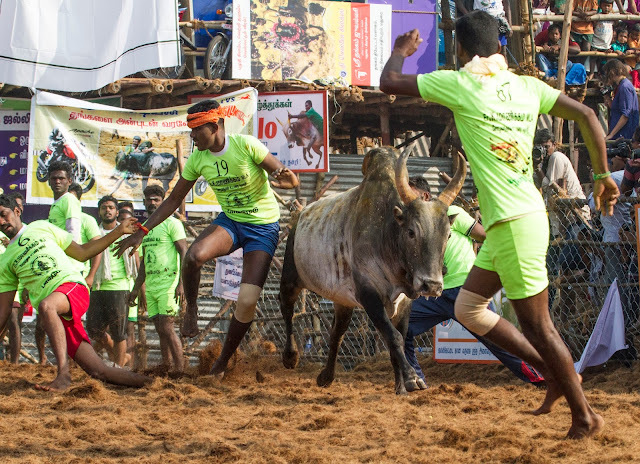 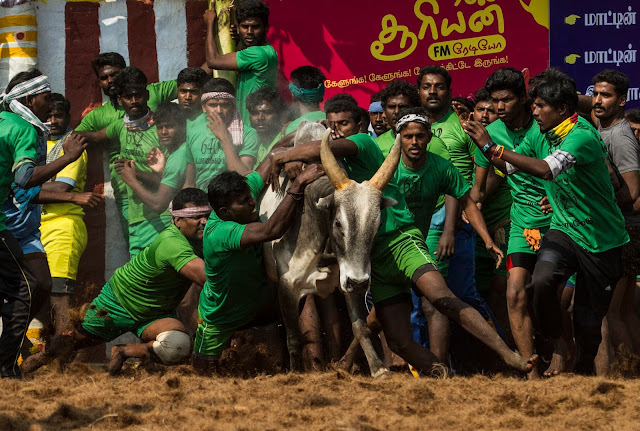 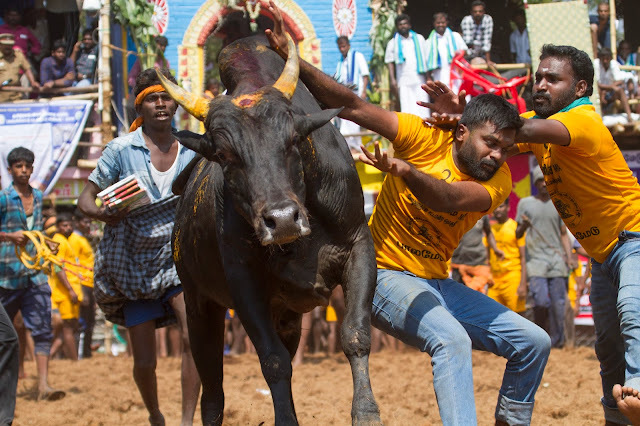 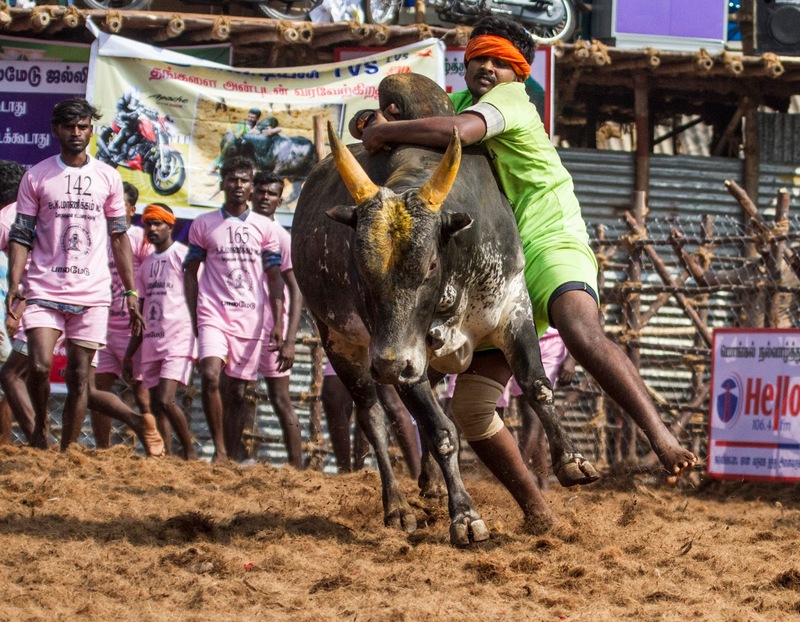 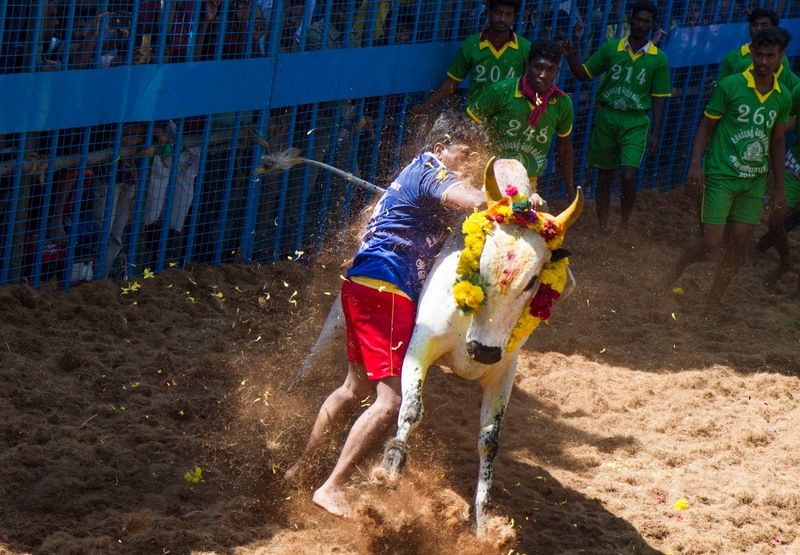 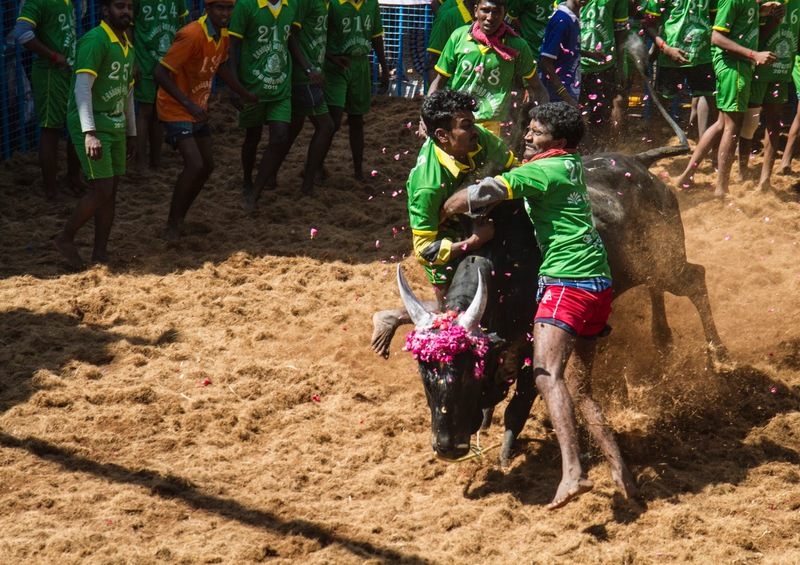 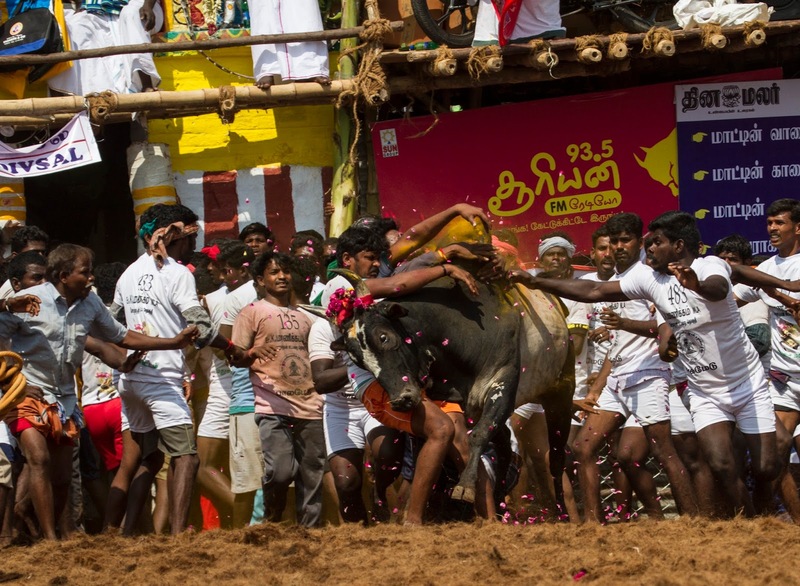 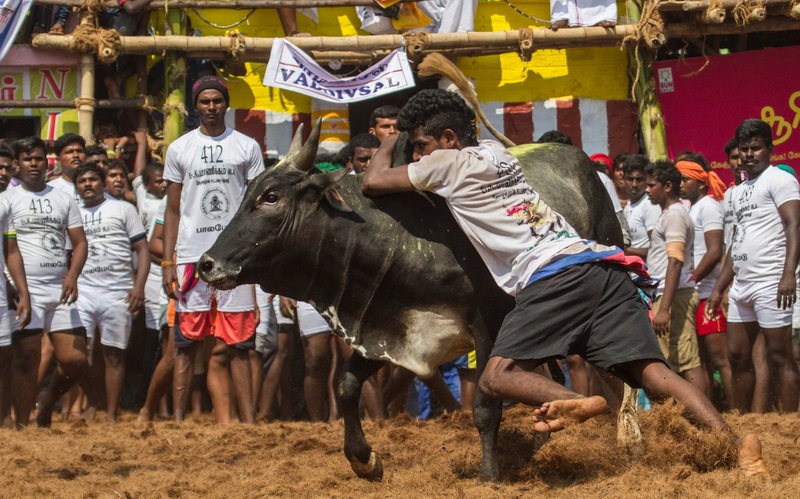 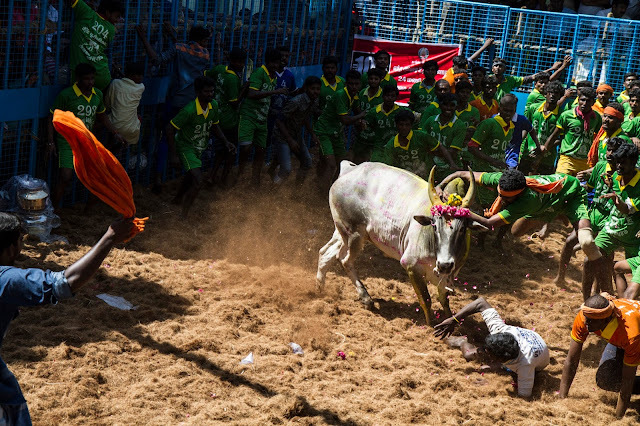 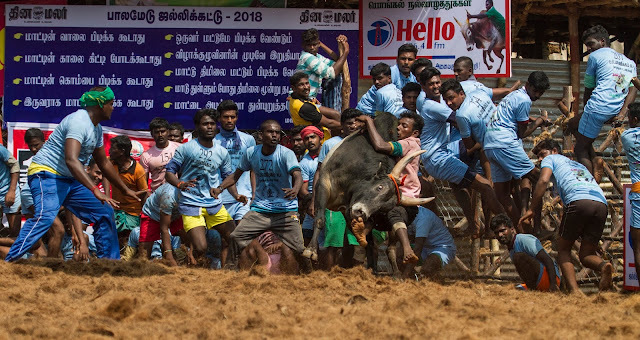 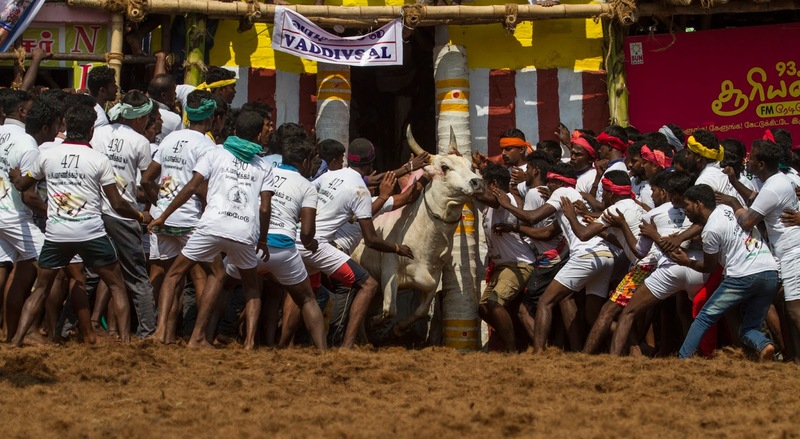 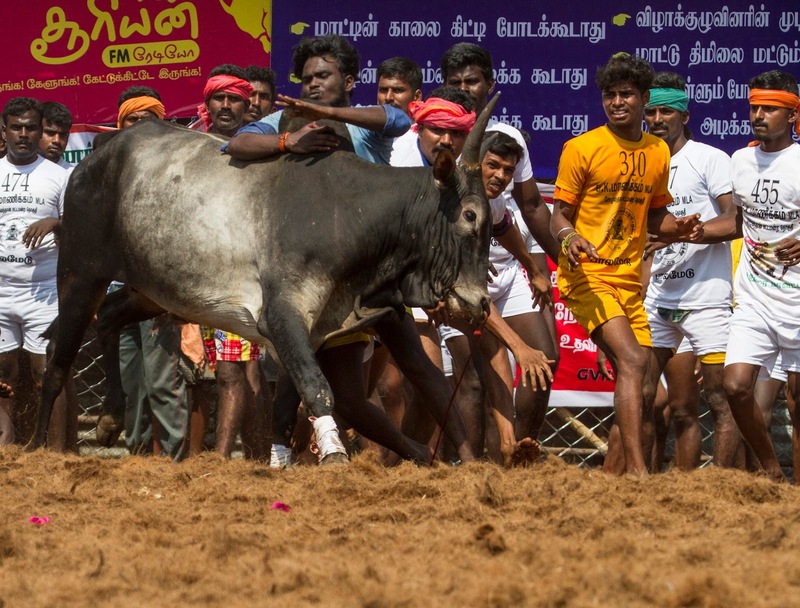 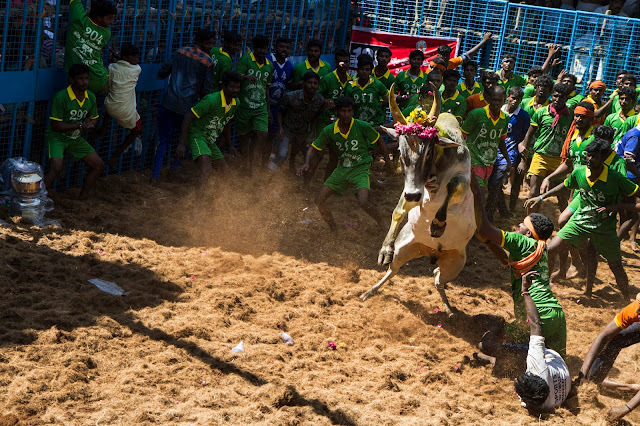 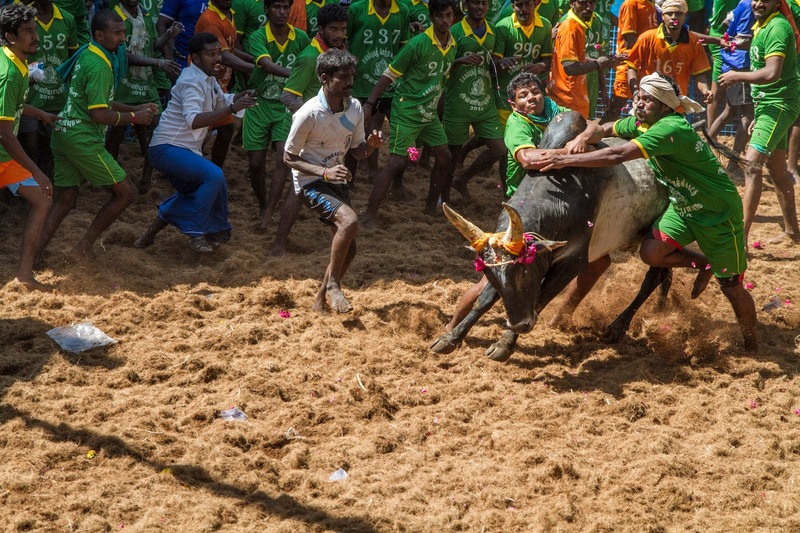 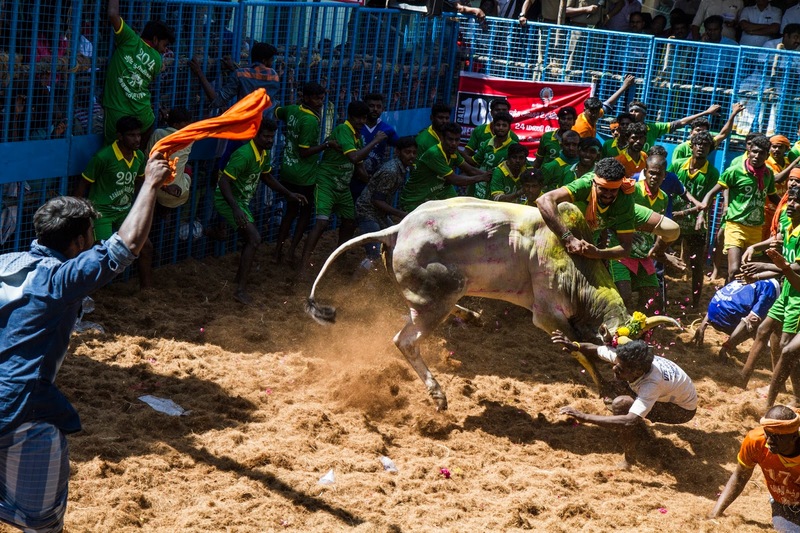 Jallikattu also known as eru thazhuvuthal and manju virattu is a traditional sport in which a Bos indicus bull is released from vadivasal and participants try to grab the large hump on the bull's back with both arms and hang on to it while the bull attempts to escape. Particiapnt should not hold the tail or horn. 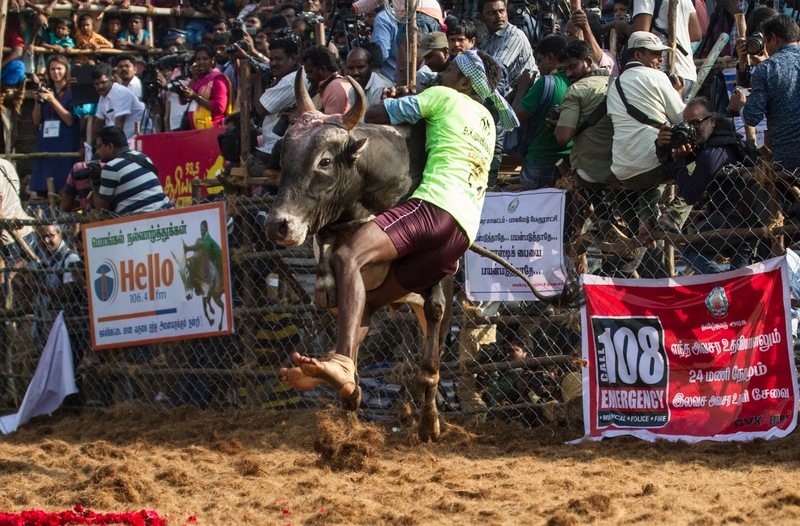 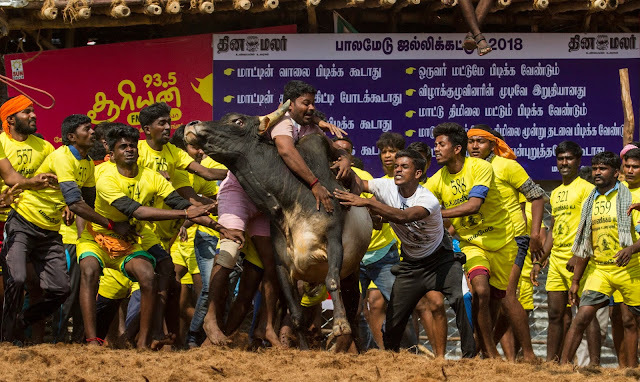 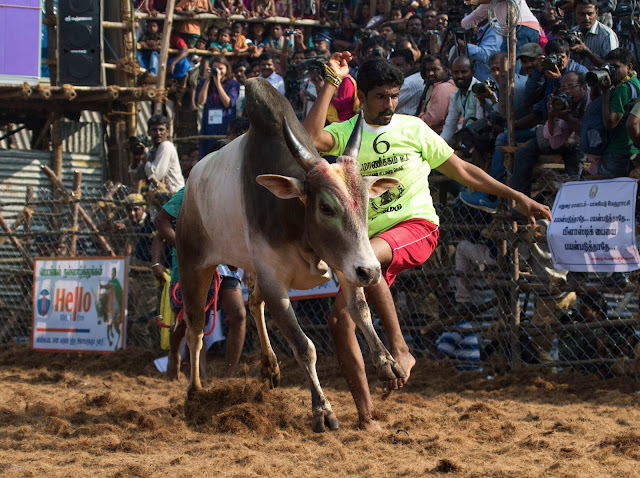 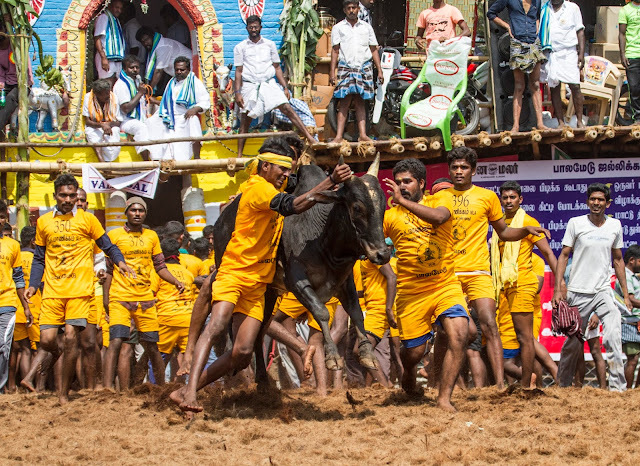 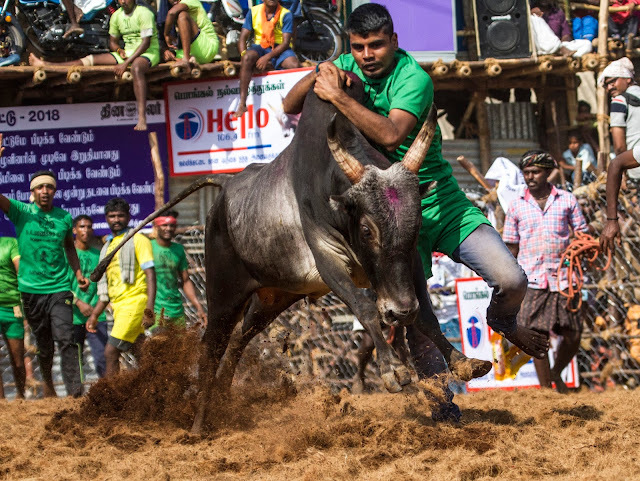 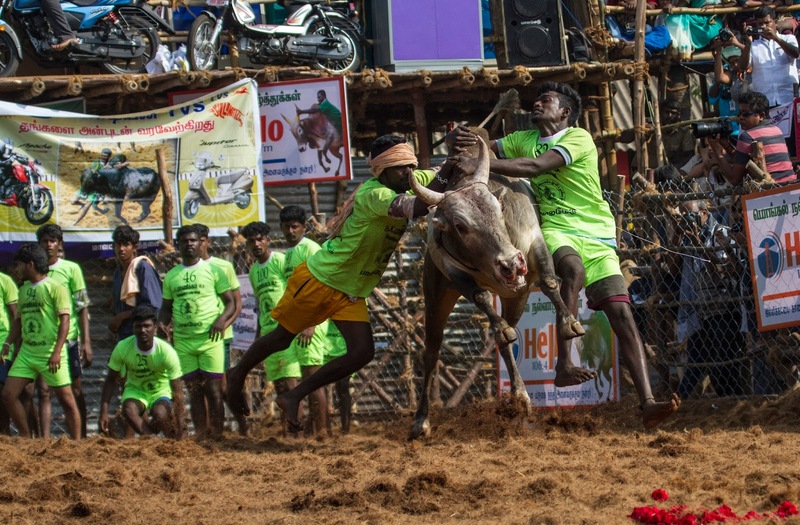 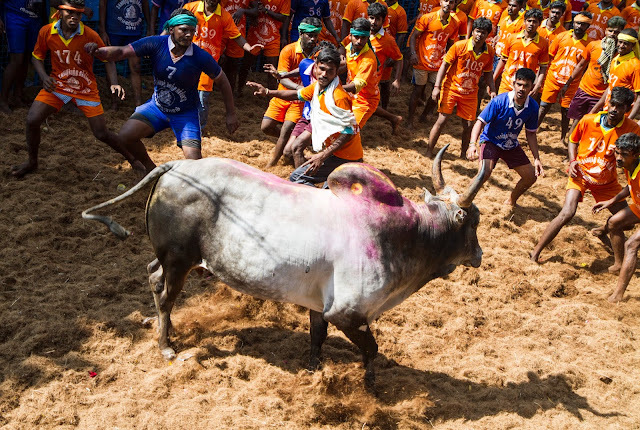 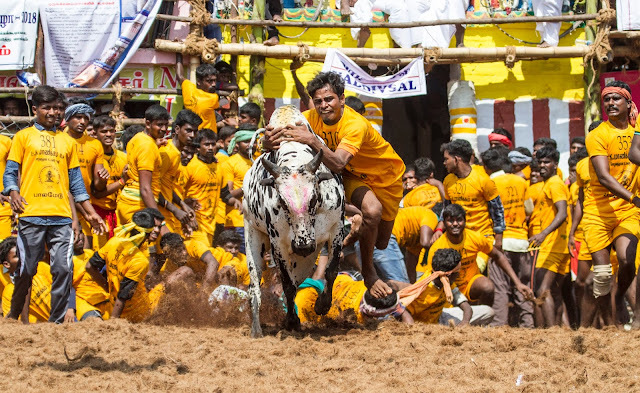 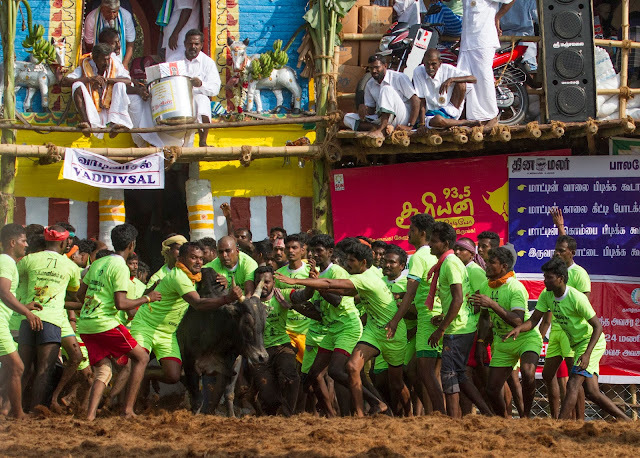 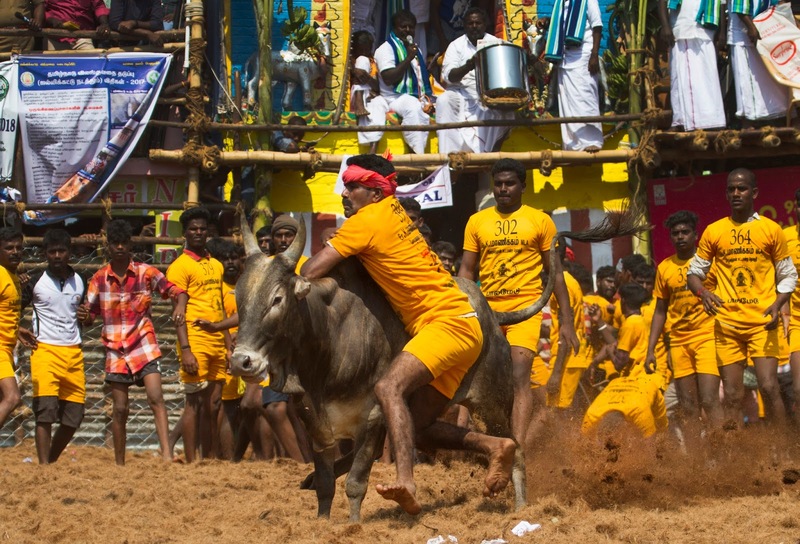 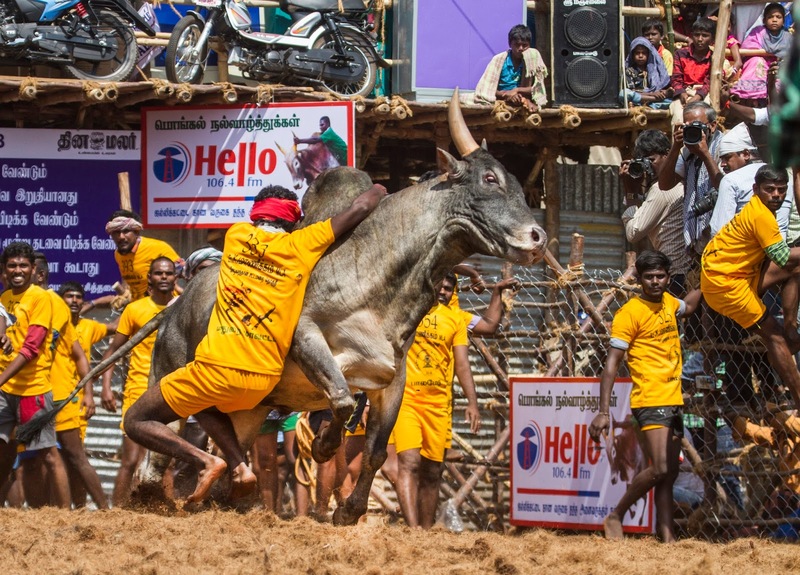 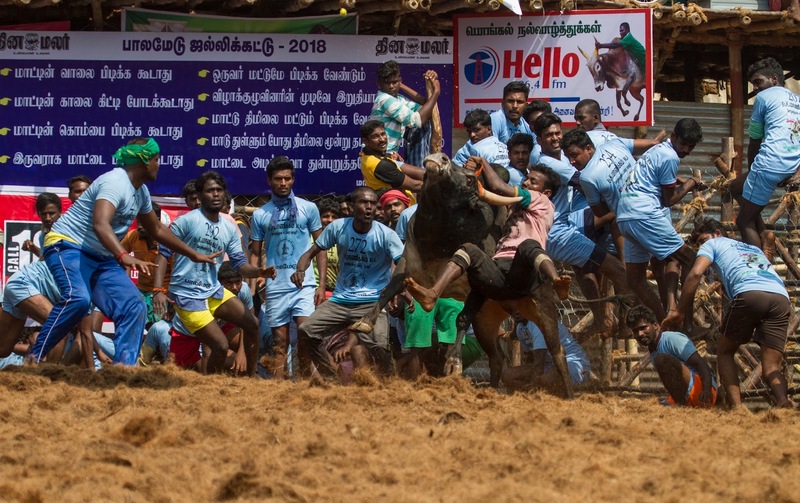 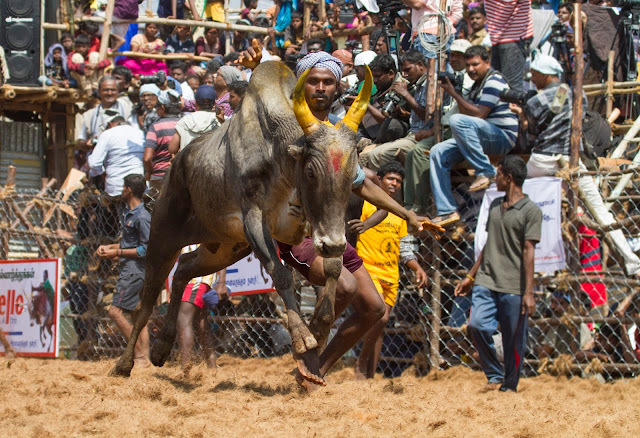 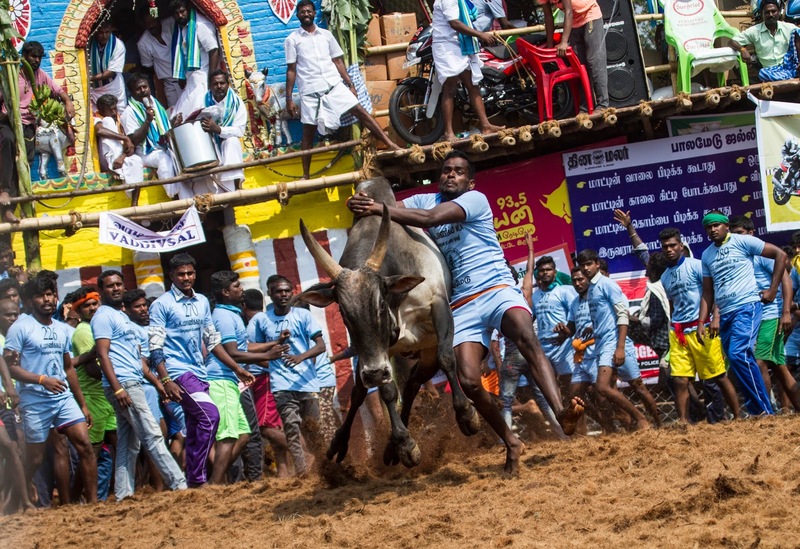 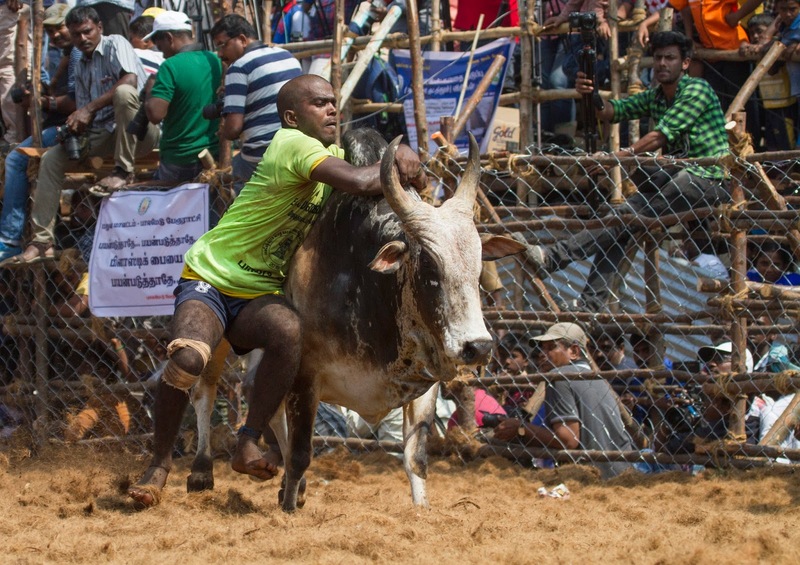 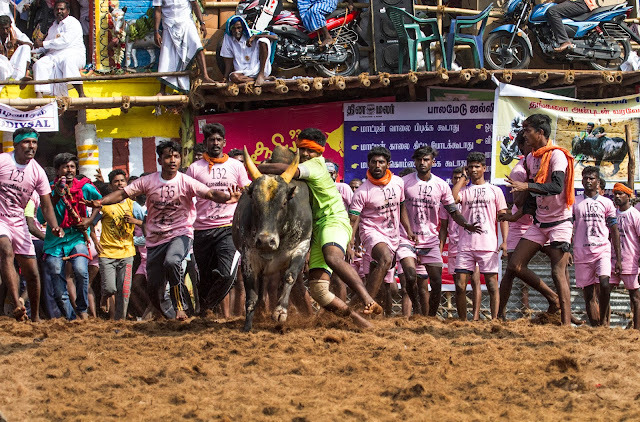 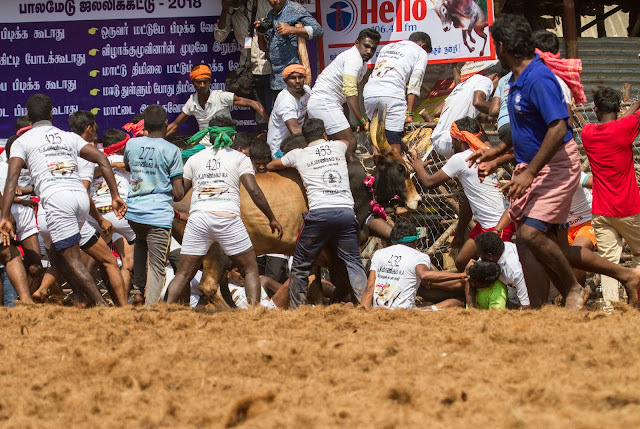 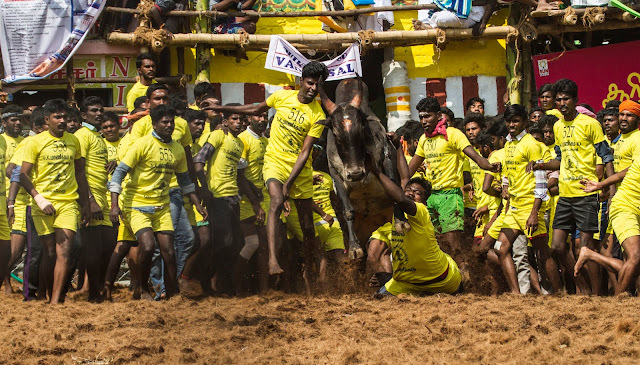 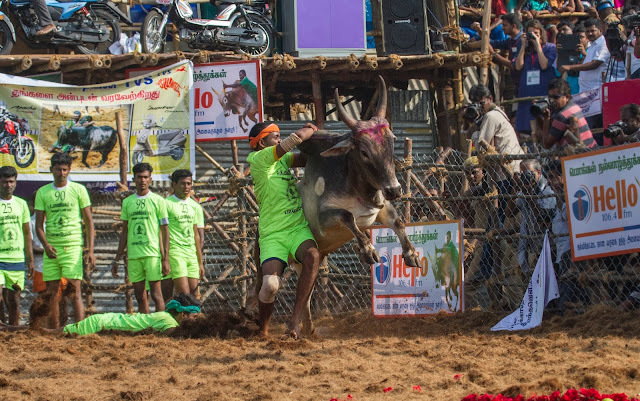 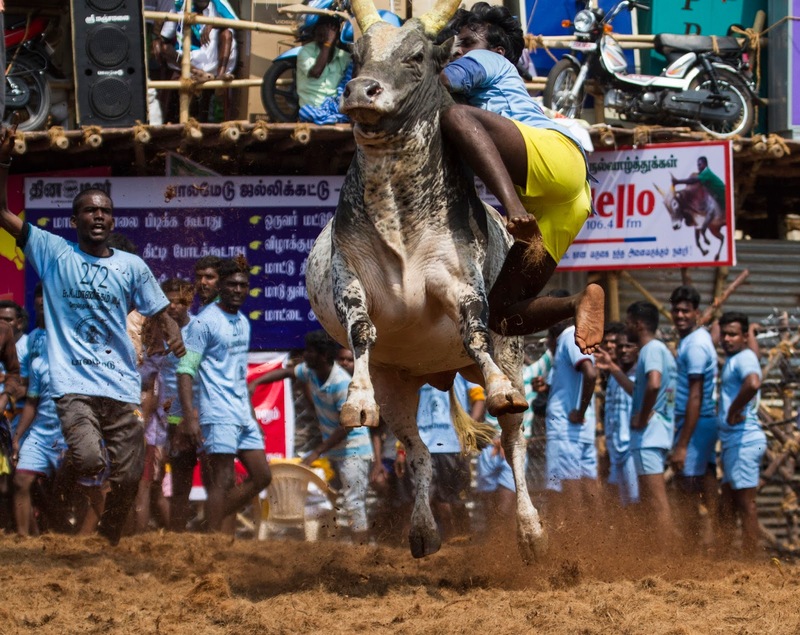 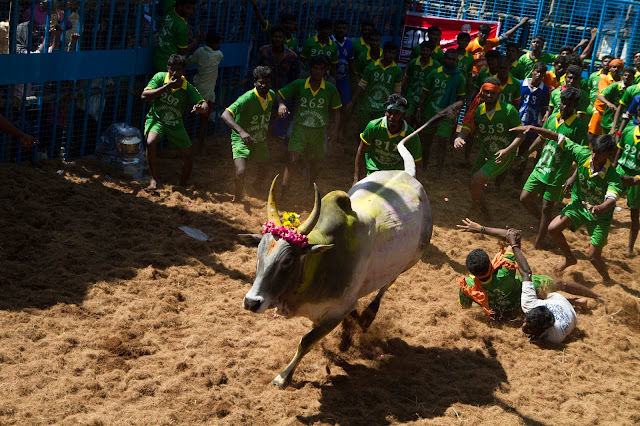 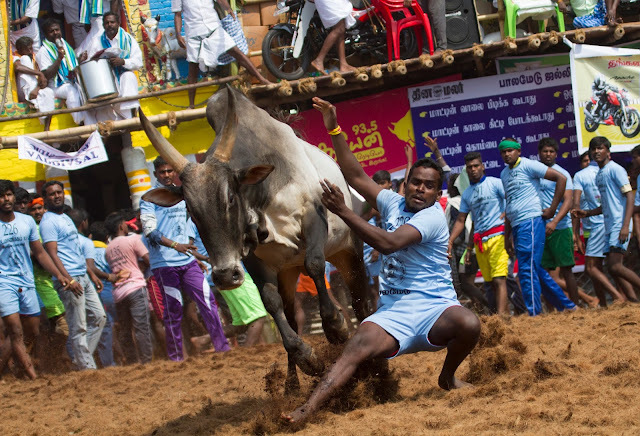 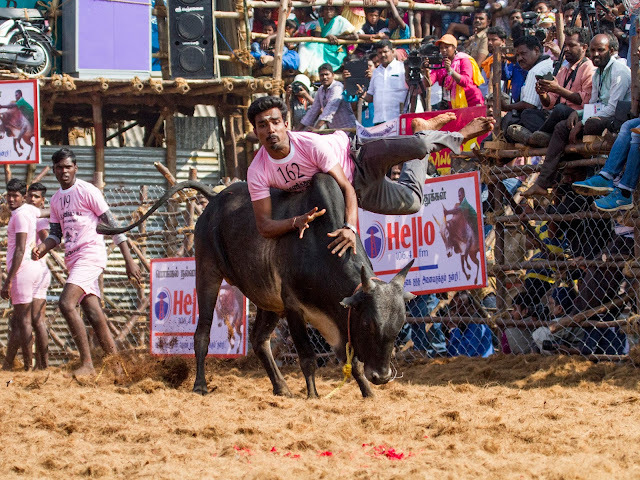 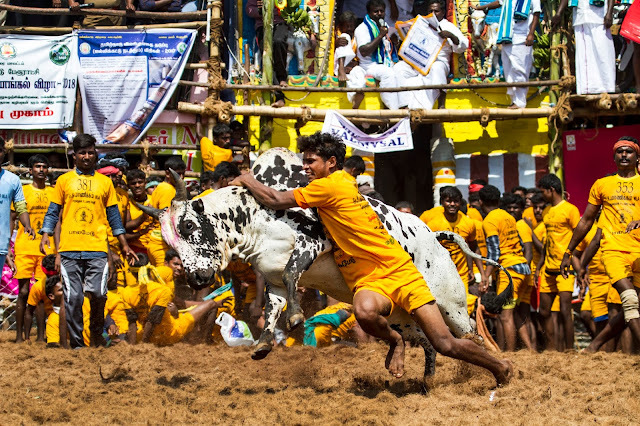 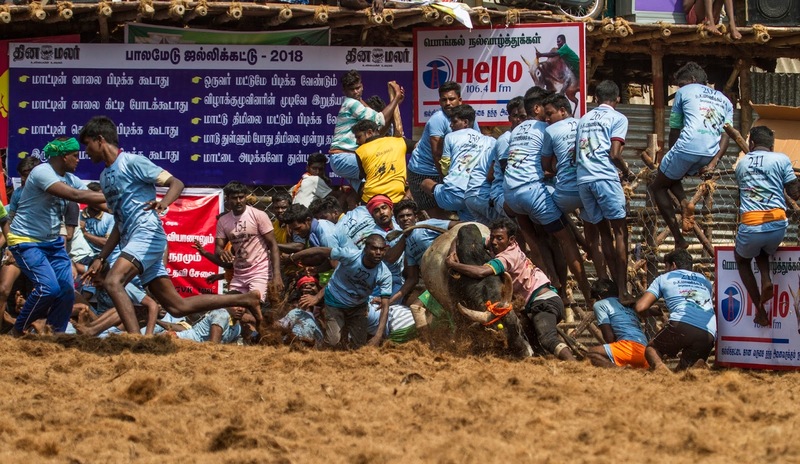 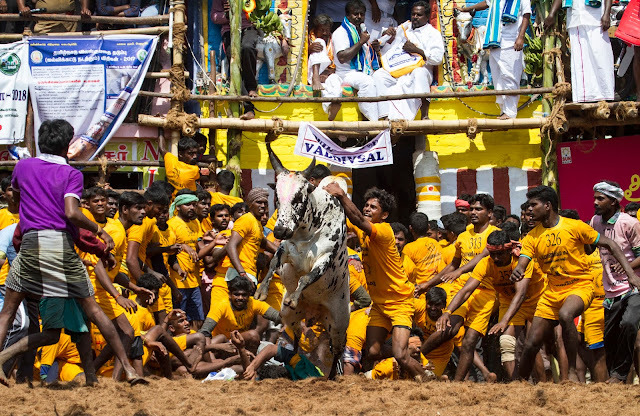 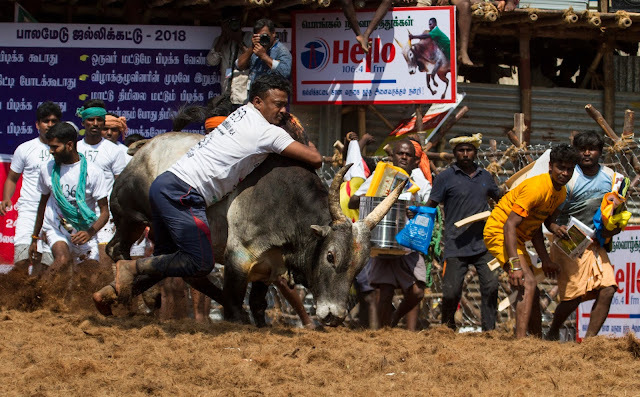 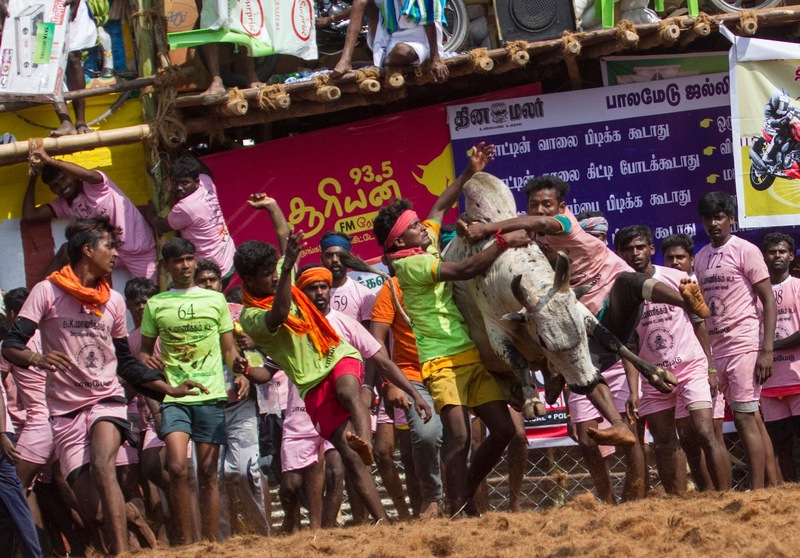 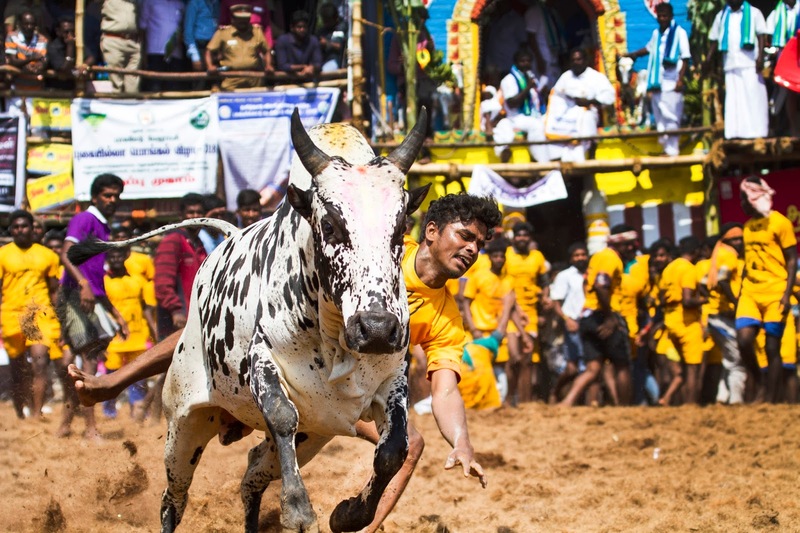 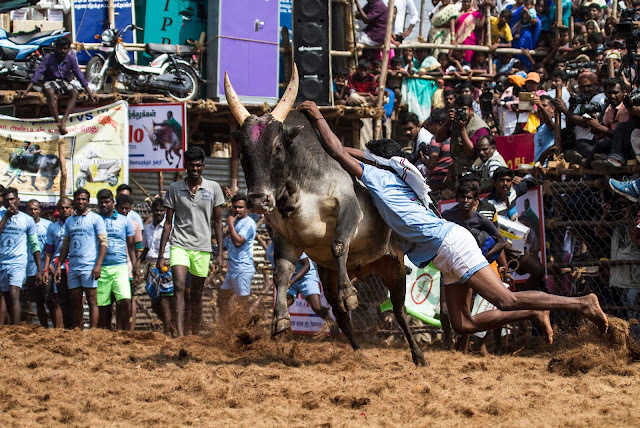 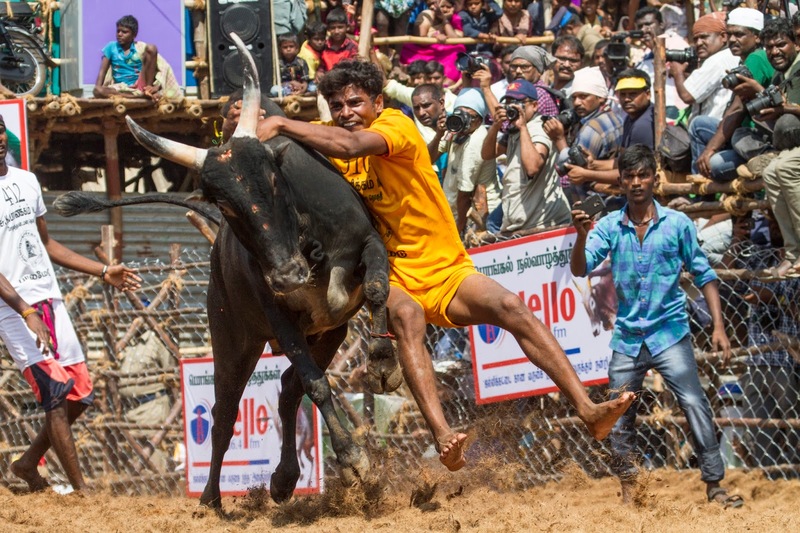 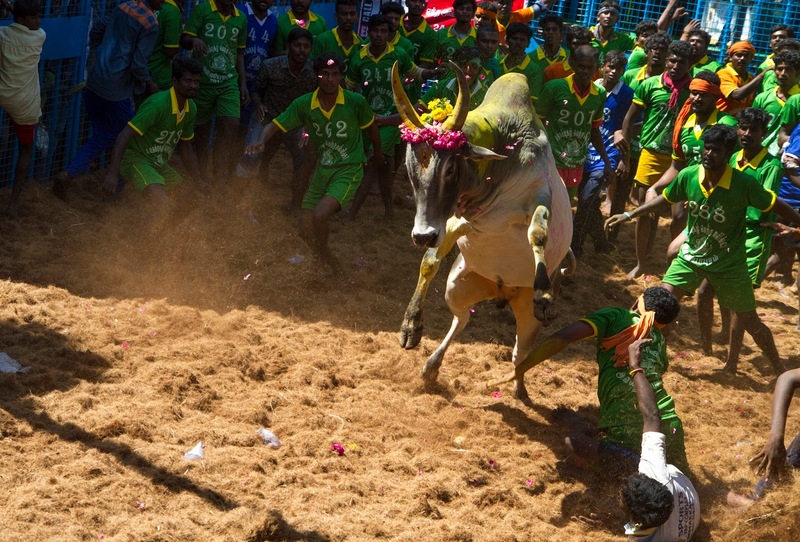 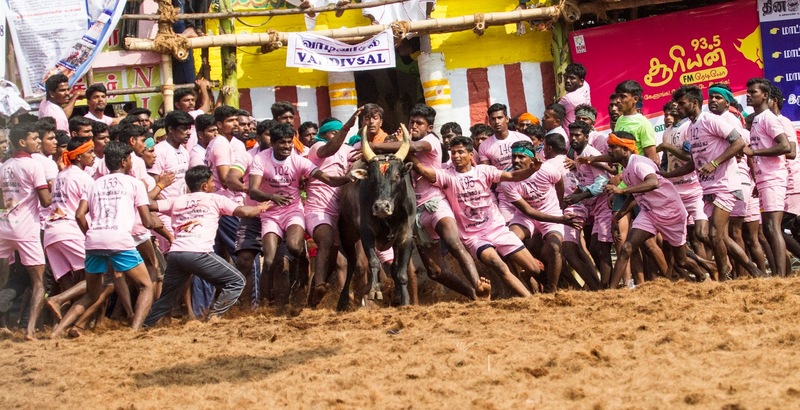 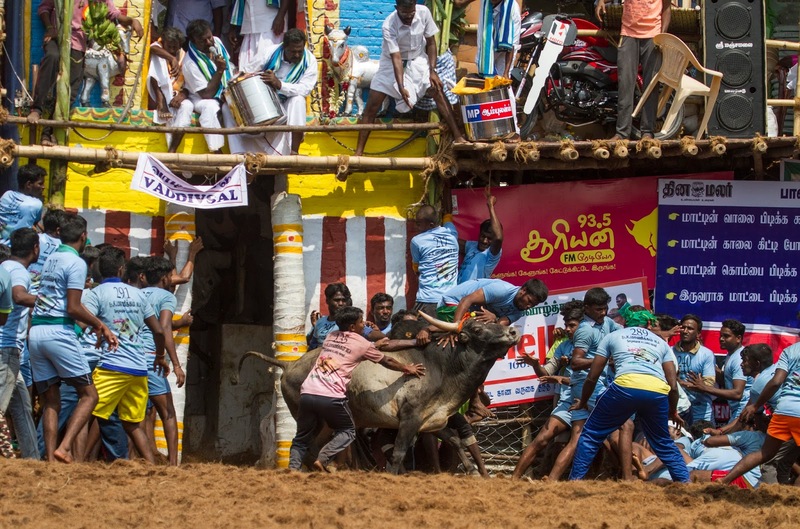 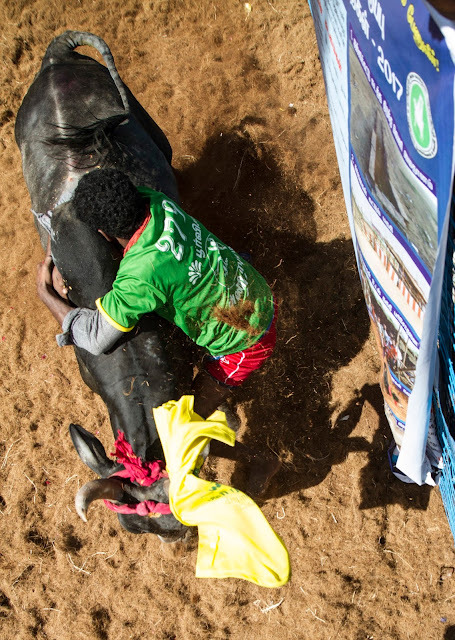 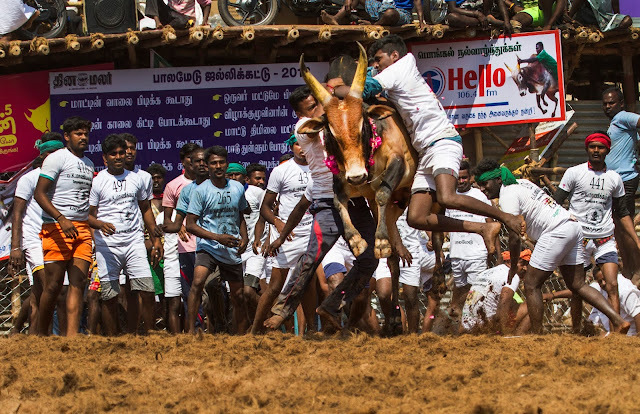 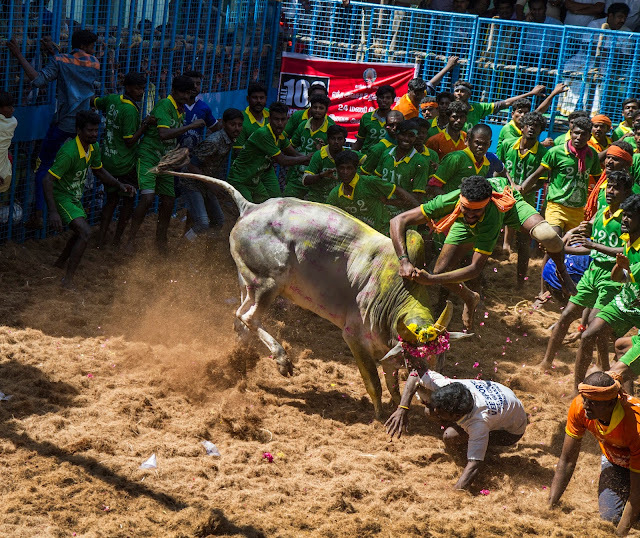 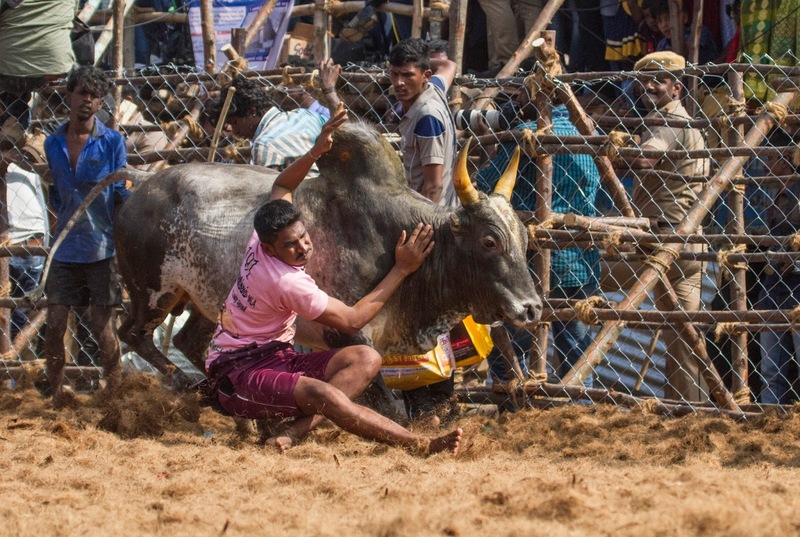 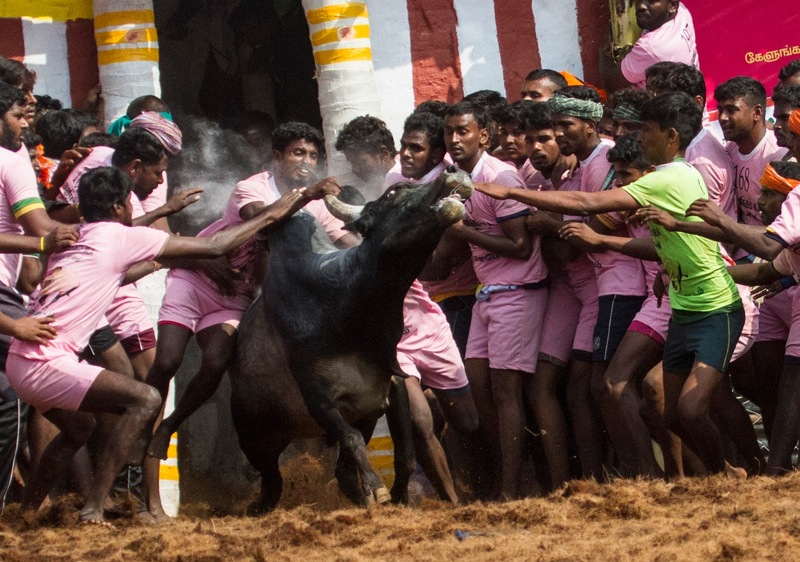 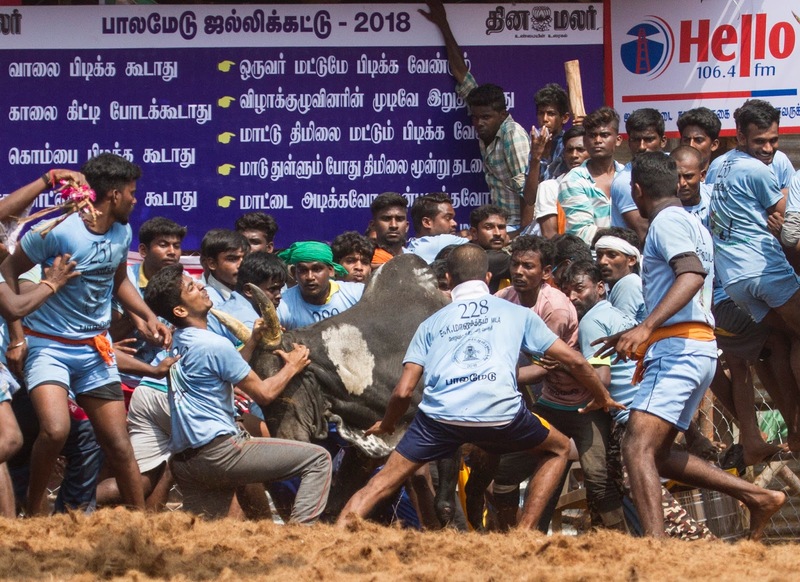 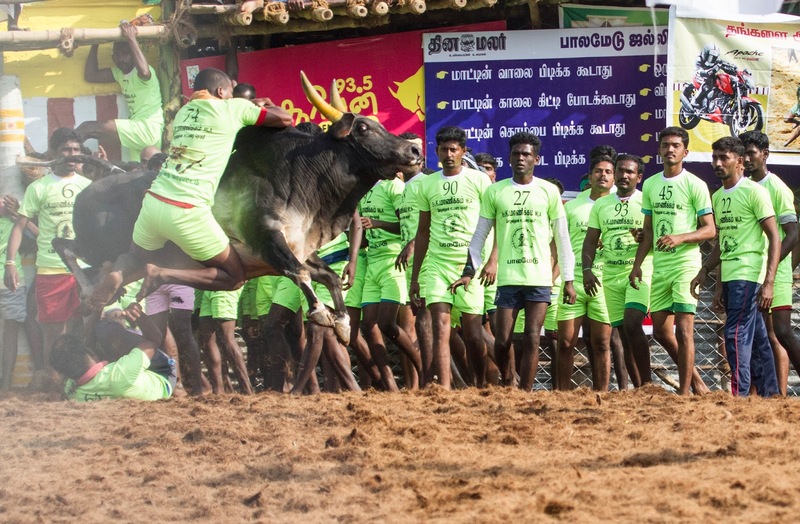 Participants hold the hump for as long as possible, attempting to bring the bull to a stop is considered as winner. Jallikattu is celebrated in Indian state of Tamil Nadu as a part of Pongal celebrations, which occurs annually 0n 14-16th January. 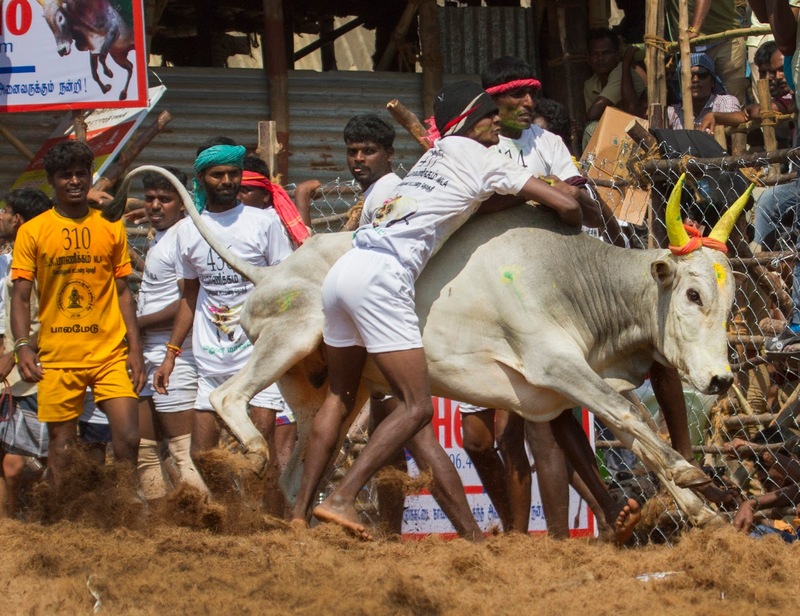 These photos was taken from Avaniyapuram and Palamedu 14th & 15th January 2018. 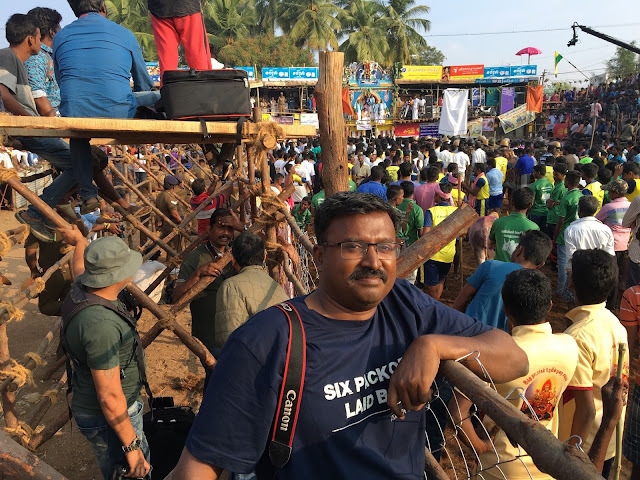 Special thanks to my friend Dhananjeyan and kumaresan for organizing this trip. How to photograph or view the event? 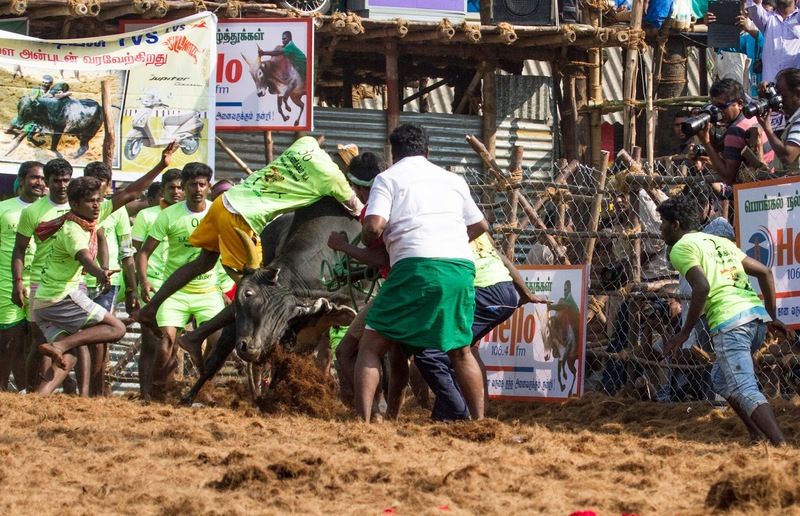 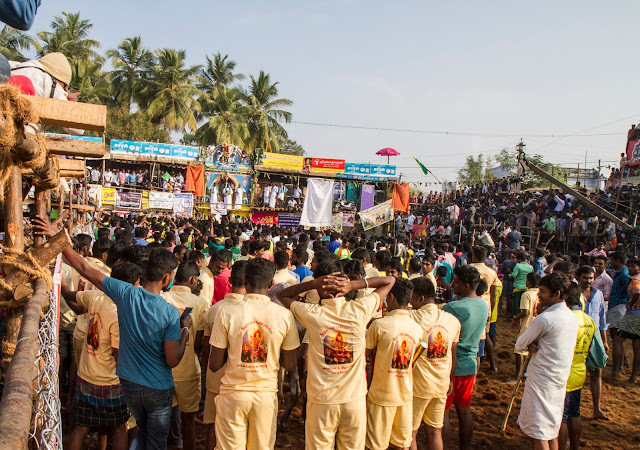 It really challenging to view the event as there will be heavy crowd and getting near to the place were the participants catches the bull is very challenging as all VIP and local people will be there. 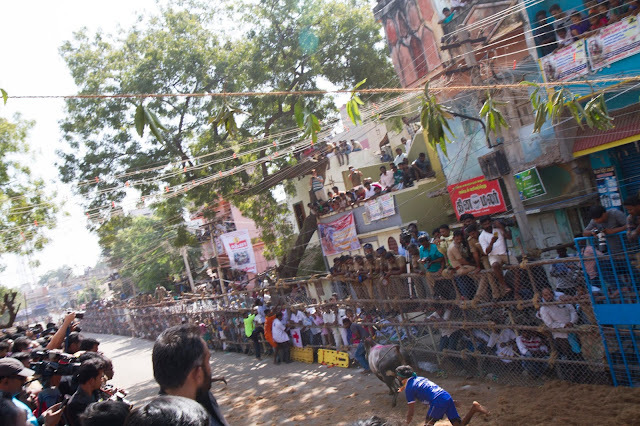 Half the the gallery will be occupied by press and other half will be occupied by the VIP. 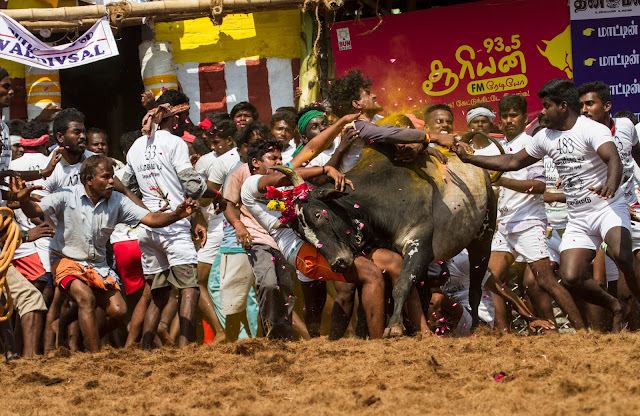 To get a good location to photography is the most challenging thing and you need to get into the place 4-5 am in the morning itself as the event usually starts around 8 am. You can also get good view from the terrace of the house but you need to know them or pay or request to get a good place for you. 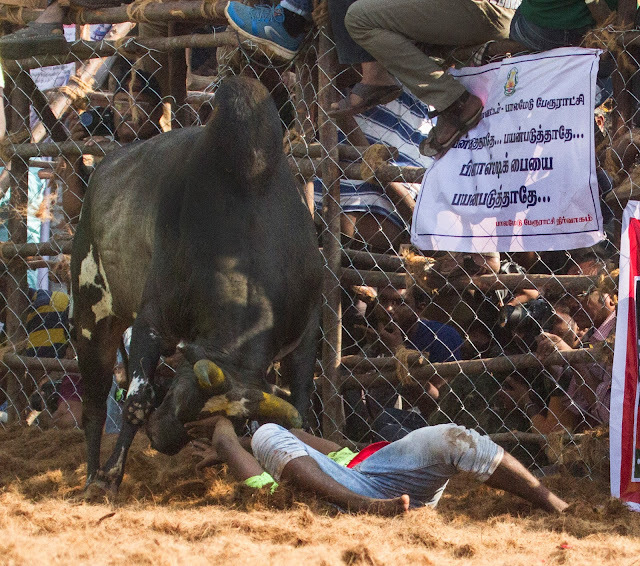 Maybe you should check with them one day before. 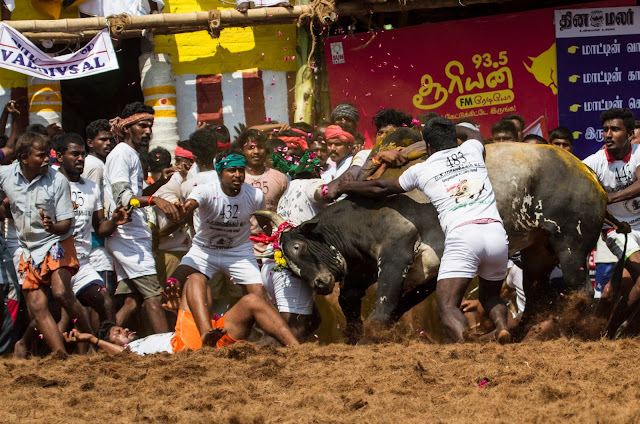 The event will be usually from 8 - 4 pm and you cannot move out or take a break, if you move out you cannot get the place again. 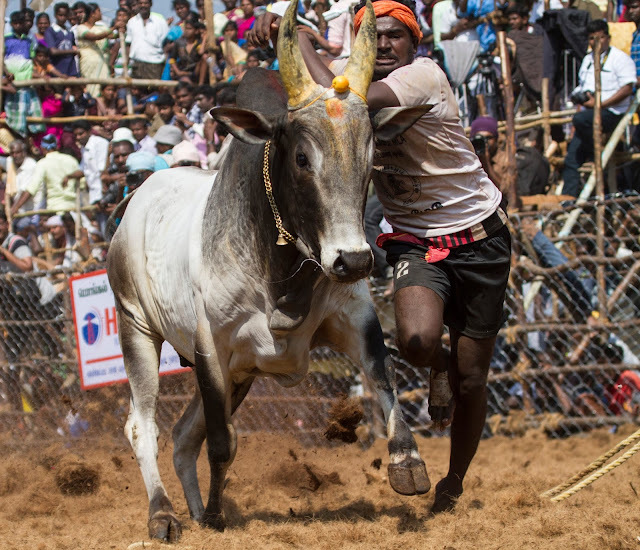 The vadivasal is called the entry gate for the bull to the arena. 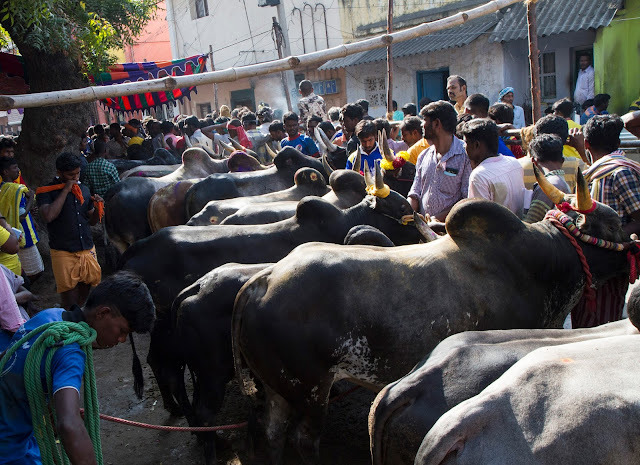 I saw a long line of bulls waiting to enter the vadivasal. The bulls look quite and nice in this area.The bull tamer / contestant should try to ‘catch’ the bull by holding onto its hump only. 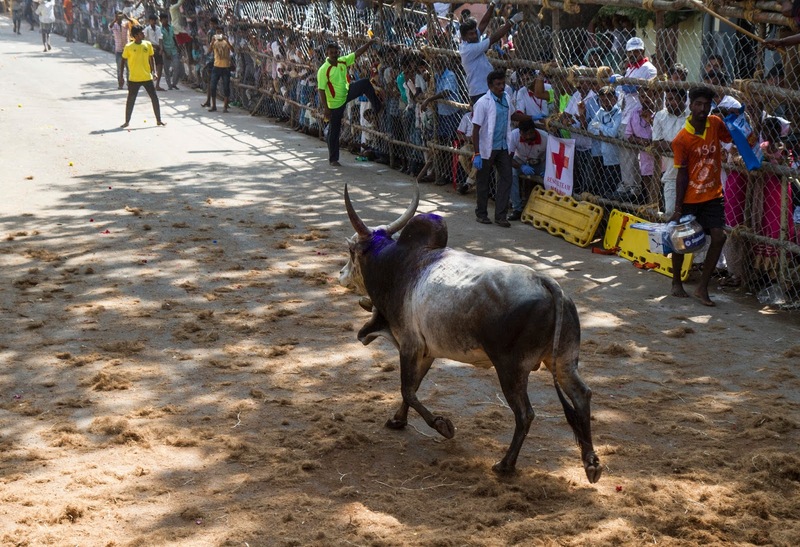 The finish line is usually less than 50 meters and the bull tamer should only catch the bull within this area. If the bull throws the tamer off before the line or if no-one manages to hold on to the bull, then the bull will be declared victorious. 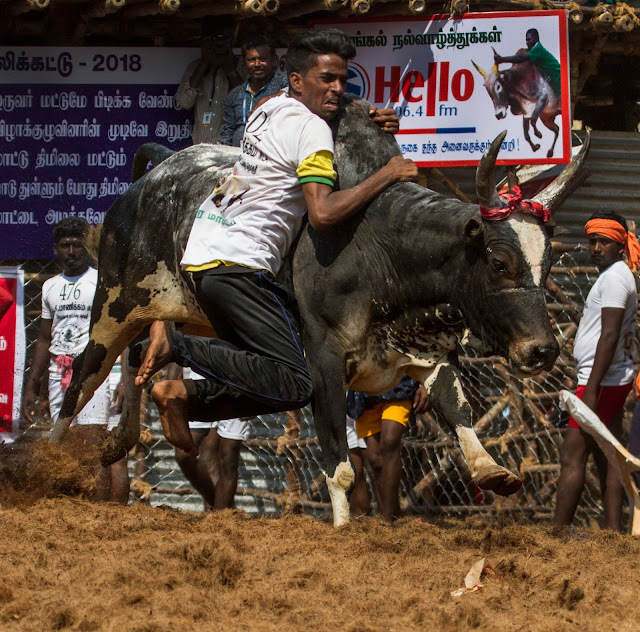 If the bull-tamer manages to hold on to the hump till it crosses the ‘finish line’, then the bull tamer is declared the winner. Only one bull tamer should hold on to the bull at one time. 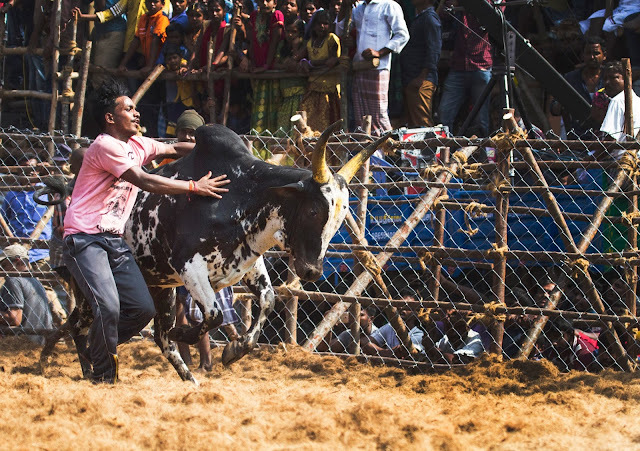 If more than one bull tamers hold on to the bull, then there is no winner. 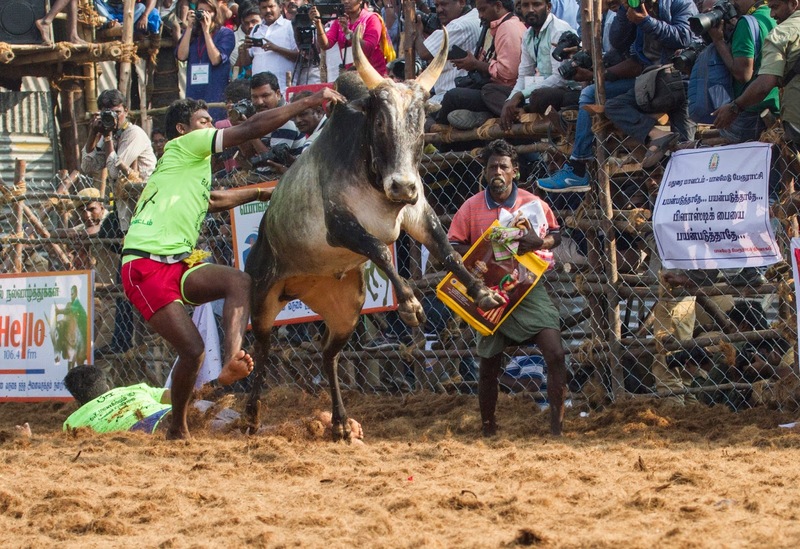 The bull tamer should only hold on to the hump. 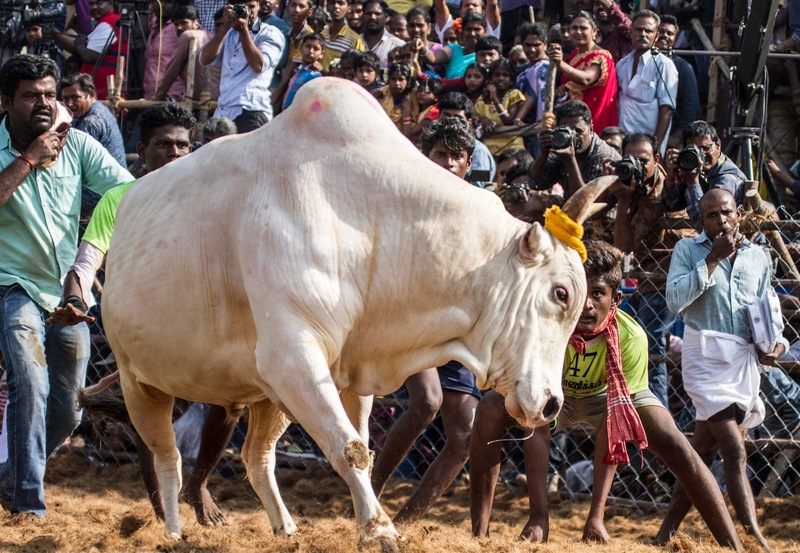 He should NOT hold on to the neck or horns or tails of the bull. 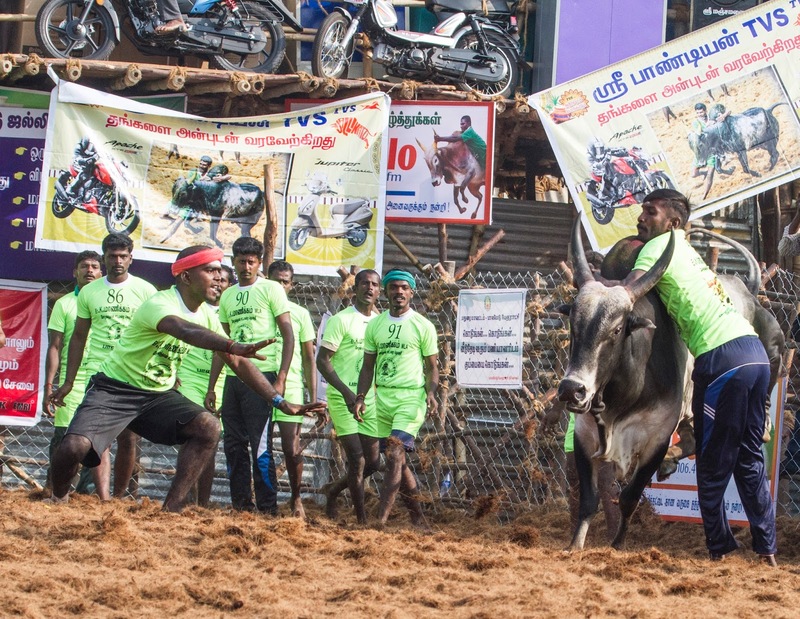 Such tamers will be disqualifies. 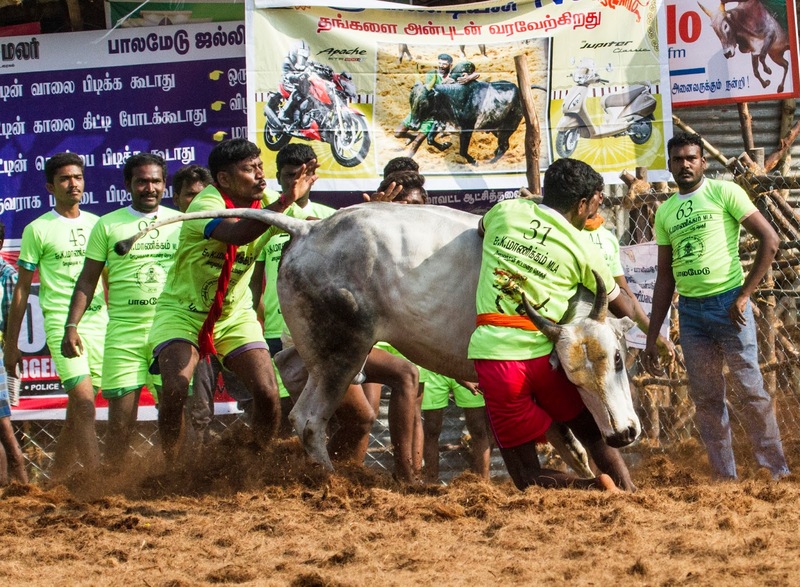 If the bulls were not caught, the prize went to the owner. The prize went to the tamer if he held onto the hump till the finish line.